Hamstring injuries are one of the most common injuries in sports and have a high likelihood of re-injury. Due to a 20-60% higher force production capability of eccentric strength, using conventional weight room exercises that are limited by concentric strength will not suffice. Most eccentric loading protocols, though effective, are not always practical and come with their own risk of injury. The Nordic hamstring curl has been shown in numerous studies to aide in the reduction of hamstring injuries. However, it is limited in its isolation of the knee joint, therefore, it is not representative of the hamstrings’ role in sprinting. Ideal means of prevention should be multi-joint, closed chain, and a focus on eccentric contractions. Over the last two posts (part 1, part 2), a brief overview of hamstring strains was presented, and the need for a better solution was recognized. It has been discussed that most effective eccentric overload protocols are not very practical, require extra time and assistance in the weight room, and come with their own risk of injury. The Nordic hamstring exercise (NHE) is generally a safe exercise, and of all of the exercises mentioned in part two, is probably the easiest to perform without a second person for assistance if an anchor for the feet was creatively fashioned. Another intervention protocol has been looked at along side the NHE, the YoYo leg curl (YYLC). The YYLC looks similar to a prone (lying face down) leg curl machine that might be found in a commercial gym, but instead of a pulley system attached to a weight stack, it uses flywheel technology for resistance. The YYLC device has been shown to reduce the incidence of hamstring injuries in elite male soccer players when implemented in pre-season training compared to a control group that performed common pre-season training methods (Askling et al. 2002). However, it shares a similar downside to the NHE in that it is a single joint exercise that focuses solely on knee flexion. As mentioned previously, this is not necessarily a bad thing if the goal is a general strengthening of the muscles around the knee joint. For prevention of hamstring strains that occur during a multi-joint movement, though, it may not be the ideal solution. 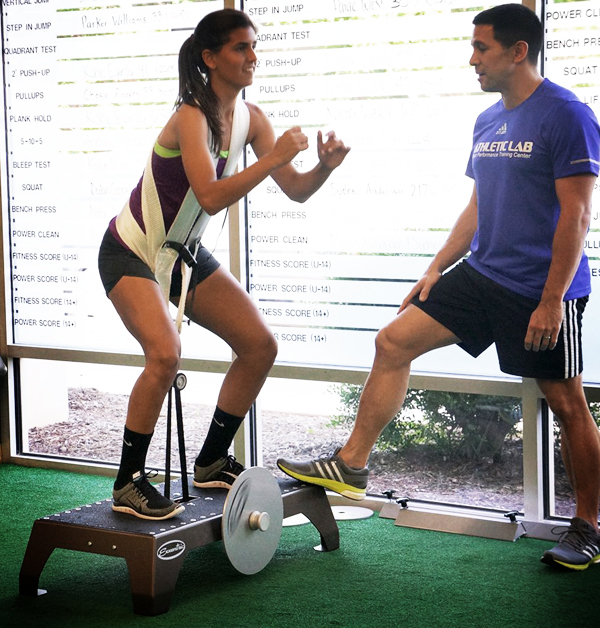 The big take-away from this exercise is the potential benefit of flywheel technology. Iso-inertia simply refers to a constant load, or mass, which is employed particularly in exercises that use a flywheel. Flywheel training is not a new concept. It has been studied for decades, dating back to a 1924 paper on maximal elbow flexion by Hansen and Lindhard. However, flywheels had also been used in cycle ergometry for many years prior to that, and before that, the use of flywheels can be dated all the way back to 1796. After the use of flywheels re-emerged in 1994 as a useful tool in the quest to combat muscle atrophy and strength loss in astronauts, Swedish ice hockey coaches Fredrik Correa and Mårten Fredriksson began developing their own training device. The “kBox” by Exxentric is a multi-exercise flywheel device that is slowly making waves as an important tool in sport performance, health and fitness, and rehabilitation. Its ability to eccentrically overload safely, with simplicity, and portability is of significant importance to sport performance and physiotherapy professionals. Simply put, a flywheel is a mechanical wheel that stores rotational energy. Using harnesses and various handles and attachments, the kBox user applies concentric force to a strap coiled around a shaft that is fixed to the axis of up to four steel flywheels. The torque generated causes the flywheel to accelerate, and collect kinetic energy. When the strap fully uncoils, the moment of inertia of the flywheel causes the strap to wind back up, requiring a large eccentric force to decelerate the wheel. The flywheel will eventually stop and a large concentric force is required to get it started again. Find out more about the kBox by Exxentric at www.exxentric.com. Variable Resistance. Flywheel training allows the athlete to experience multiple levels of resistance in one set without having to stop and switch out weights or dumbbells. 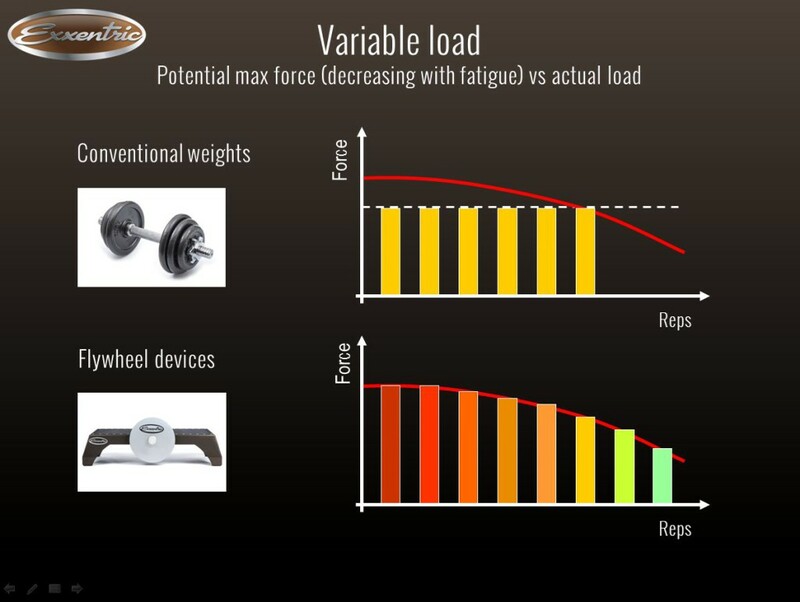 The more torque you apply to the flywheel the more resistance you experience. This variable resistance also allows for every rep to be maximal, despite any fatigue accumulated throughout a set. You may be producing less force but you are still putting 100% of effort into the rep to move the wheel. Eccentric Overload. At the top of the lift, as the strap begins to recoil and the moment of inertia of the flywheel is at its greatest, choosing to decelerate in a shorter period of time than it took to generate concentric force necessitates a much higher eccentric force. Therefore, each rep adheres to the different force generating capabilities of both the concentric and eccentric muscle actions. In other words, when squatting on a kBox, stand up as hard as you can in the concentric phase and as hard as you can, try to resist the strap from pulling you back down in the eccentric phase. Supramaximal Loading. While the eccentric overload described above is technically supramaximal loading, there are ways to achieve even higher eccentric forces using a flywheel device. One example would be doing a conventional dead lift followed by an eccentric RDL. The added quadriceps recruitment in the dead lift adds to the concentric force to be converted to a supramaximal eccentric load on the glutes and hamstrings when switching to an RDL on the way down. To take this concept further, a double support pull concentrically followed by an eccentric single leg RDL can be done. This takes a large concentric force generated by two legs and transfers it to roughly double the eccentric force due to the switch to unilateral support. Multi-joint exercises. All of these examples presented so far have been multi-joint exercises that are closed-chain and eccentric in nature. To achieve these same effects with the free weight, machine based, and bodyweight dependent eccentric training protocols that were discussed in part two would be impossible. The evidence that flywheel training has a positive effect on preventing hamstring injuries has potential but is incomplete. This is especially true because much of the research is still on single joint movements like the YoYo Leg Curl. Little is known right now about the effect a device like the kBox has on preventing hamstring strains in athletes, however, the theoretical implications are definitely positive. It is important to note, albeit fairly obvious, that the concepts discussed in this three part series are far from a perfect solution. Hamstring injuries are still a monumental problem in sports despite what we know about the mechanism of injury and the intervention methods with the highest potential. Dr. Mike Young of Athletic Lab (M. Young, personal communication, July 20, 2015) once referred to sprinting as “controlled violence.” At speeds anywhere from 8-12 m/s, ground contact times that last fractions of a second, stride frequencies of 4-5 contacts per second, and ground reaction forces 3-5 times bodyweight, this violence is kept under control with great skill, precision timing, strength, and stiffness. The window of opportunity for perfection of every stride, and every contact is overwhelmingly small. Perhaps as sport performance coaches we take the complexity of sprinting for granted in our pursuit of the perfect weight room solution to the prevention of hamstring injuries. If the only one to one ratio of transfer of training to sprinting is actually sprinting, and part of the mastery of sprinting is to not get injured while doing it, then perhaps the only way to truly prevent hamstring strains through training is, well, to sprint. Askling C, Karlsson J, Thorstensson A. Hamstring injury occurrence in elite soccer players after preseason strength training with eccentric overload. Scand J Med Sci Sports 13: 244-250, 2003. Cowell J, Cronin J, Brughelli M. Eccentric muscle actions and how the strength and conditioning specialist might use them for a variety of purposes. Strength and Conditioning Journal: 34(3) 36-38. 2012. Norrbrand L, Pozzo M, Tesch PA. Flywheel reistance training calls for greater eccentric muscle activation than weight training. Eur J Appl Physiol: 110(5) 997-1005, 2010. Verkhoshansky y, Siff M. Supertraining. Sixth ed. Rome: Verkhoshanksy. 2009. p. 51-52. What about us coaches who do not have access to such equipment due to high cost etc (KBox isn’t cheap). What are the recommendations, RDLs, Russian Curls, KB/Dumbell swings ? I understand this seems like an advertisement for the kBox and my answer may also. But I do not know of another tool that accomplishes the goal of eccentric loading in as safe or as practical of a way that the kBox does. That being said, I agree. The kBox is not cheap and not everyone will be willing or able to use the piece of equipment. The fact is that effective eccentric training can come at a high risk when done improperly, but there are several ways of getting there if implemented correctly. Your exercise selection is indeed a good one for eccentric training but while range of motion, and movement mechanics are important to consider (for example RDLs are a hip extensor exercise closely related hip extension in sprinting), movement velocities are also very important. Standard weight room squat negatives, RDLs, Leg Curls, etc even with an eccentric loading emphasis can never mimic the contraction velocities of sprinting. Faster ballistic movements, depth jumps, sprinting, etc all will have a greater effect on the eccentric capacity of the muscle, specific to the target movement (in this case sprinting).